One of the national government’s positive missions has been to grow the food that we need in Sri Lanka instead of busting up millions of dollars to import junk food or processed rubbish. As a tropical paradise, Sri Lanka has been blessed by being Asia’s rice bowl till recently. In addition we have hundreds of varieties of nutritious vegetables, grains and fruits and we need to be aware of the need not just to eat well but to eat wisely. This week the country was stunned by charges that the state’s premier trading company the Cooperative Wholesale Establishment (CWE) has imported and sold a huge stock of plastic Basmati rice from Pakistan. The allegation, which has gone viral on social media, has not been denied or confirmed by CWE Chairman T.M.K.B. Tennekoon, who says samples have been sent for testing by the Medical Research Institute (MRI). But the National Movement for the Protection of Consumer Rights has called for an immediate probe by the Director General of Health Services and alleged that the plastic Basmati may be a part of the wholesale racket by Sri Lanka’s rice mafia. The Association says the cultivation of rice, which has been part of Sri Lanka’s culture and civilization for thousands of years is being destroyed by this rice mafia which has thrown hundreds of thousands of once proud farmer-families into the mud holes of history. While the spotlight now is on rice, we also need to focus on other food items. According to United States-based physician and nutritionist Dr. Al Sears, we need to monitor what chemicals go into our food. Even when there’s science to prove the health risks of new ingredients, the authorities drag their feet and it can take years or even decades before they pull harmful additives out of the market. He says that when a processor wants to add a new chemical to food, the authorities do not require testing. The food company just sends a notice to the officials. The notice says that the ingredient is “generally recognized as safe” or as safe. Dr. Al Sears says for example, in the US it happened with partially hydrogenated oils, or trans fats (Margarines). They were considered safe for years. But in 2013 the US Food and Drugs Administration (FDA) withdrew its safe status after these fats were linked to serious heart disease. Yet the FDA still permits trans fats at low levels in foods. Artificial food colourings are another example. At least six of them were considered safe for years and later banned by the FDA. Two others -- Red No. 3 and caramel colouring used in colas -- have been found to cause cancer in animals. But the FDA still has them listed as safe. There’s another so called safe ingredient we need to reflect upon, Dr. Al sears says. It’s widely used in food products in the US even though it’s banned in the European Union. It’s called carrageenan. This common food additive is extracted from red seaweed (Chondruscrispus). It’s sometimes called Irish moss. Carrageenan has no nutritional value. It’s used as a thickener and emulsifier. Food companies add it to improve the texture of ice cream, yogurt, cottage cheese, soy milk, almond milk, chicken stock, deli meats and other processed foods. There are two forms of carrageenan -- degraded and food grade. In animal studies, the degraded form has been proven to cause tumours. The International Agency for Research on Cancer classifies it as a possible human carcinogen. But food grade carrageenan is not much better. Tests show that the food grade type also contains some of the degraded form -- in some cases as much as 25%, Dr. Al Sears says. The food grade version can become degraded. When we eat food-grade carrageenan, it can break down and become degraded in the gastrointestinal tract. It also becomes degraded with exposure to heat, bacteria and mechanical processing. Even the food grade version has been shown to cause inflammation and colon cancer in animals. It causes the same kind of inflammation that is the root cause of many serious diseases. 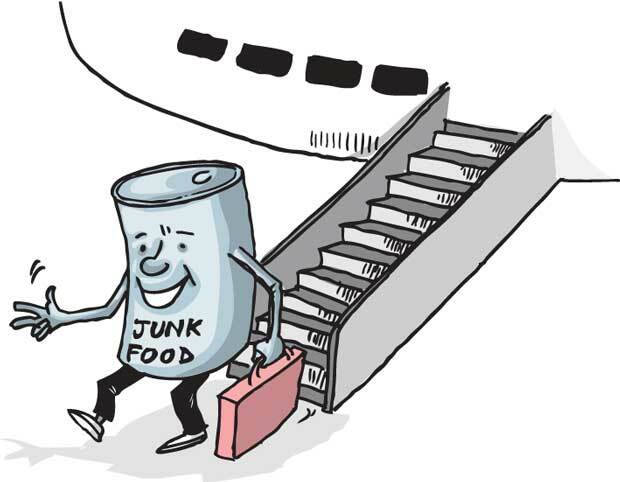 In Sri Lanka, the Consumer Protection Authority responsible for food safety, needs to play a much bigger role in making the people aware of unsafe or dangerous substances in some of the imported junk foods or processed food we are importing and giving even to children.